Prayer is communications with God. Throughout the OT and NT believers spoke to God, cried out to Him, praised Him, and dialogued with Him. One prayer pattern is the acrostic ACTS representing Adoration, Confession, Thanksgiving, and Supplication. Study the following biblical references and consider how they address the questions listed below. If using this outline with a Small Group, consider assigning different Scriptures to different individuals and relating them to one or more of the questions. Then scroll down the page to review our recommended resources for the topic of Communicating With God through the ACTS pattern and consider how the various articles or podcasts provide further insights relating to this topic. How do insights gained from the above verses impact on your view of prayer? How would you describe prayer to another Christ-follower? To one with limited Christian faith or awareness? Describe or define prayer? Why is it foundational for Christian faith? Considering Rev. 5:14 and other verses, what is your “picture” or image of the Trinitarian God? In what ways do the Revelation images enhance your adoration, praise, and worship of the Lord now? The man after God’s heart still committed sin – Yet how can you echo David’s honest prayer of confession? For what specific acts in your life do you continue to thank the Lord? Specifically for whom and for what are your supplications going up to God? Spend time offering prayer to the Lord, using the ACTS format. Make important decisions with the confidence that God has revealed His direction. Christian officer, leader—how important is prayer to you? 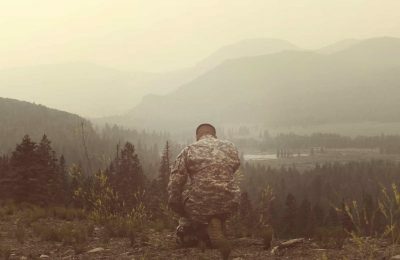 As Christians serving in the military, do we recognize what and for whom we should be praying for in our leadership roles? Godly officers and leaders pray. OCF offers many extra resources as you continue digging into the subdomain of Communicating With God. Certain events in life give us a new and tangible appreciation for the power of prayer. Every day is a good time for a reality check. The benefits of fasting shouldn't be overlooked. As Christians in the military, we ought to see the parallels between persistence in life and persistence in prayer. Imagine--the same God who fashioned the heavens and earth, and made man in His image--knew this would occur. The following short story was written by OCF member MAJ Mario Miglietta, USA. It is based on a story told during an OCF Bible study that he attends. A person in the Bible study told of a Soldier from his battalion who had fallen on hard times, but who found encouragement and hope from a letter he received from his little sister. Mario says he was inspired by that story and wrote about what the Soldier had gone through—"how I imagined the story evolved."